With the fall semester under way, parents and students are choosing extracurricular activities. Hockey? Chess club? Band? Recent research shows that another option — adolescent work experience — can pay big dividends later in life. Many schools and parents push children to engage in excessive extracurricular activities. Meanwhile, adolescent work has been increasingly categorized as non-desirable and only for those facing the demands of poverty. Yet more than 50 per cent of high school seniors work, suggesting teen work is more than a product of income inequality. In fact, recent research shows work experience has many positive impacts for all. Students can learn many life skills through working, and if teenage job opportunities are overlooked, they can miss out on many benefits. The benefits are both short-term and long-term. In research we report in Research in the Sociology of Work, we analyzed the Youth in Transition Survey data collected jointly by Statistics Canada and Human Resources and Skills Development Canada. The data represents 246,661 Canadian youth in 2009 tracked from the ages of 15 to 25. This long time frame allowed us to look at the longer term impacts of working as a teen. Working year-round at the age of 15 led to a higher chance of being employed at 17 to 21. But what of the quality of the work? Those who worked year-round at 15 had higher incomes at ages 17 to 25, and at ages 21 to 23 had higher quality job matches. Some of these benefits were even stronger when working for a family business rather than a stranger. In fact, working in a family business led to further enhanced career networking and even better matched jobs later in life at the age of 25. This is an important finding, considering roughly 45 per cent of Canadian youth report having worked in their family’s business at some point. While this number may appear high, when you take into account that many children work in small family businesses or farms, it highlights the impact such work has on a wide swath of society. In our recent Family Business Review article, we analyzed Statistics Canada data from the National Longitudinal Survey of Children and Youth representing over 570,000 Canadian youth who were 16 to 17 years old in 2002-2003. We wanted to disentangle a puzzle that has plagued adolescent development literature and shown mixed impacts of working as a teenager. Many previous studies assumed that working as a teen interferes with family time. These studies focus on the time trade-off work represents, and frame working as a negative influence on family relationships. But a large percentage of working teens work for a family business where they can spend time with family members while working. Our study separates out those who work for a family business from others. Our findings show that those teens who worked year-round for their family business between the ages of 14 to 15 had a better relationship with their parents, which continued to get even better by the time they were 16 to 17. The effects go beyond just their relationship with their parents. Previous studies report depression is a leading cause of illness and disability for teens. Many extracurriculars do not give children enough opportunity to fail and build resilience. Many students are not learning the skills they need to succeed. Self-esteem has previously been shown to be linked to resilience. In our study, those same teens who worked year-round for their family business between the ages of 14 to 15 had fewer incidents of depression and higher self-esteem at 16 to 17. These psychological benefits can be long lasting. But we caution that teens can also work too much. 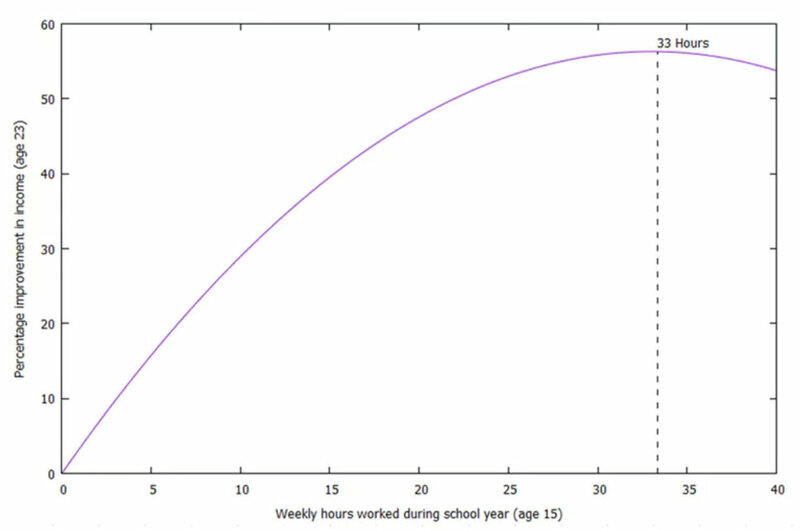 In the Research in the Sociology of Work piece we find that working too many hours starts to reduce the positive effects. The potential benefits of adding work back into the extracurricular mix are immense, but things should be taken in moderation. Parents and teens should certainly consider work as a positive extracurricular experience, but not overdo it to the point of it hindering development. And, of course, we do not condone exploitative work in any amount.